Members of Rotherham Golf Club enjoy both a wonderful rolling parkland setting for their golf course and a magnificent old neo gothic building as their clubhouse. The Thrybergh estate is ancient - it was mentioned in the Domesday Book - and the clubhouse dates back to 1814, when it was built by the Fullerton family, who owned the property at that time. The golf club was established in 1903 and Sandy Herd, the previous year’s Open Champion, was invited to set out a 9-hole course for the founding members. It’s not known when the layout was doubled in size but a match in 1920 involving Herd, J.H. Taylor, James Braid and Abe Mitchell may well have marked the opening of the extended course. Today, the course measures a modest 6,350 yards from the back tees, playing to a par of 70. Feature holes include those around the turn: the bunkerless par four 8th, the signature par three 9th and the first of “the triangle holes,” the par five 10th. Par fours at the 5th and 15th holes attract the lowest stroke index rating on each nine but the toughest hole is kept until last, at the 456-yard 18th, where the fairway doglegs left to the home green. 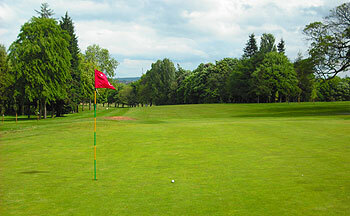 Rotherham is a really enjoyable parkland golf course located in the heart of South Yorkshire. The layout of the holes is very interesting and the changes in elevation, on this established tree-lined property, are negotiated nicely. The magnificently appointed gothic clubhouse, with practice putting green in front, is a grand spot to be on a hot summer's day and whenever I've played here in the Lee Westwood Trophy there has always been a good vibe around the place. The course is not without its faults but the 18 holes at Rotherham rise and fall beautifully over springy turf and the greens ensure that the challenge is significant throughout. The putting surfaces on my most recent visit were quick, true and if you got above the hole it led to all kinds of trouble. Being able to play from the fairway is crucial because trying to hold the greens from the lush semi-rough is twice as difficult. There are a number of short to medium-length par fours throughout the round but each requires you to shape the ball differently from the tee and into the greens. The greens can be terrifying when quick as they slope quite a lot. They complement the relatively short nature of the course nicely and will often dictate your final score. Have to say, slightly disappointed with Rotherham. Yes it is a fairly nice looking park-land course but not many holes inspired me to be honest. The front nine is a little up and down with many holes adjacent to each other – for me the par-3 3rd stood out, around 170 yards uphill and plenty of protection but the par 3 9th is not good at all – 200 yards of carry and not a pretty looking hole. The start of the back nine is the best part of the course…Par 5 10th turning right and then a drivable par-4 at the 11th – The 12th is a nice par 4 with a drive over the valley but it is the last third of the course that is very ordinary. The par 3 14th requires a tee shot to be hit over trees that are only 50 yards from the tee, a little strange – rather than go through the rest of the holes one by one, I’ll just say they did not inspire me that much. On a positive note, the staff and the members are very friendly and welcome visitors with open arms – It would be interesting to see what others think of the course. Rotherham Golf Club is more than 100 years old now and it is set gloriously in pleasant parkland with the most imposing and magnificent clubhouse that would befit any “Royal” Golf Club. It’s represents a solid test of golf and the condition is always impeccable, better than many ranked courses on the website. A real beautiful gem. I played Rotherham in September and must say i found the course a very good test. The treelined fairways were tight and the rough so thick it was to be avoided at all cost. The greens were very true indeed,it appears the new head green keeper is doing his stuff! Miss Rotherham golf club and you are missing out. Our society played at Rotherhamat the end of March,the course was surprisingly dry for a parkland but the greens were unbelievable,smooth and quick,a really great day,we will be back in the summer for more of the same. Beautiful parkland layout with just about the most imposing clubhouse you are ever likely to see. Very popular in the area due to its easy-walking layout and fine conditioning. The club boast a number of top amateur players and boast a golf team to match the club's stature. Off the course they have the friendliest pro and bar staff I have come across and get the day off to a great start. Very enjoyable parkland experience.